In theory, that’s enough to get her going on a knitting adventure of her own, but be ready to answer questions. Sometimes photos and written instructions aren’t enough to learn something. Anyway, knitting the n00b hat together will give you a chance to hang out with your super-cool niece. Win-win. This entry was posted in FYI and tagged beginner, beginning knitting, christmas, christmas gift, christmas present, kit, knitting kit, learn to knit, learn to knit kit, n00b, n00b hat on December 18, 2013 by onemilljellybeans. Thanks for playing along with me and my hat-making shenanigans! I’ve compiled the last month’s-worth of n00b hat-ness into one easy-to-find .pdf pattern. Feel free to download it, use it, or share it, whatever you like. 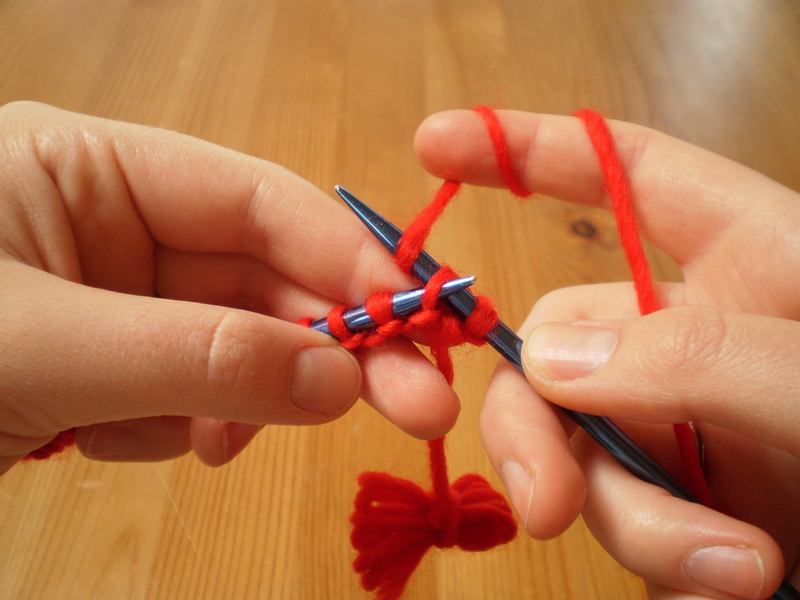 Maybe your friend/mom/dad/kid sister/weird guy down the street wants to learn how to knit. I’d be delighted if folks started using this pattern more and more. And I’d love to see everyone’s first n00b hats! That would totally make my day! This entry was posted in Patterns and tagged hat, learn to knit, n00b, n00b hat, new knitter, pattern, tutorial on October 25, 2013 by onemilljellybeans. You’re so close to finishing your hat, I can smell it. (Or maybe that’s the spiced apple cider heating up on my stove…mmm, I love fall.) In fact, you are totally done with your knitting, and all that’s left is to do your finishing. 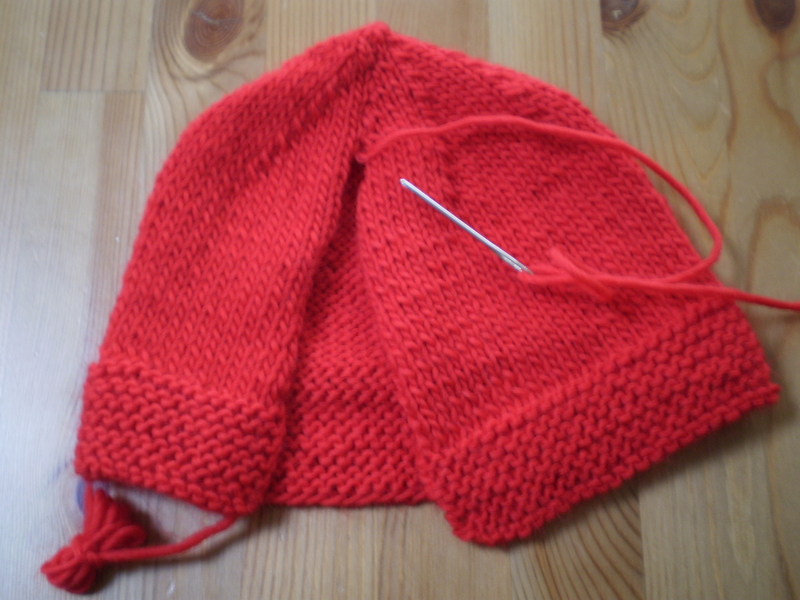 In this case, that means sewing up the seam along the back of the hat, so that it ends up… well… hat-shaped. 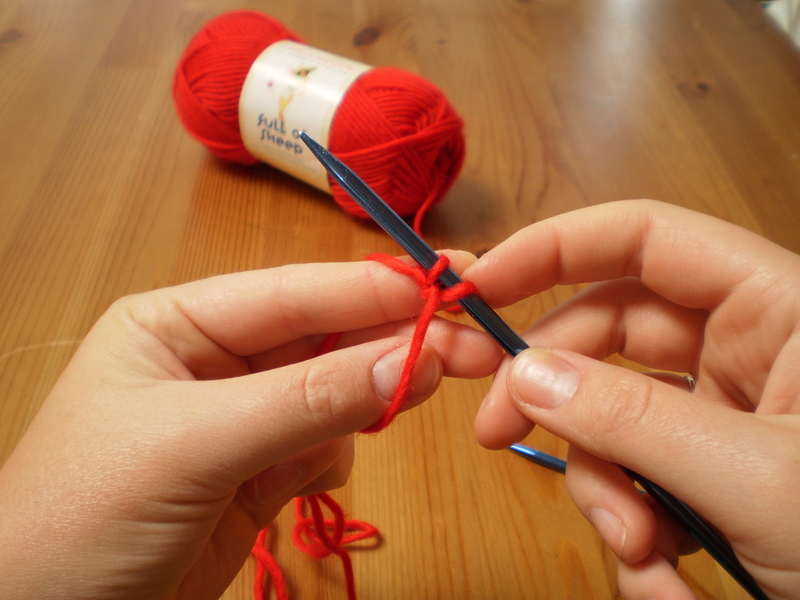 Start out by cutting your working yarn, leaving a good 18-inch tail on your project. Thread this tail onto your tapestry needle. 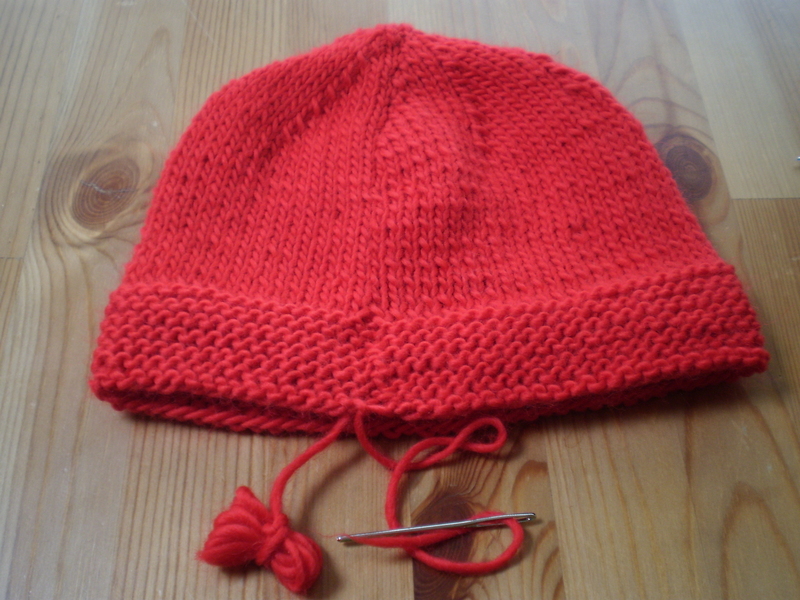 Then, turn your hat over, so that you can see the purl side facing up. Carefully use your tapestry needle to thread your tail from the left, through the 8 remaining stitches. 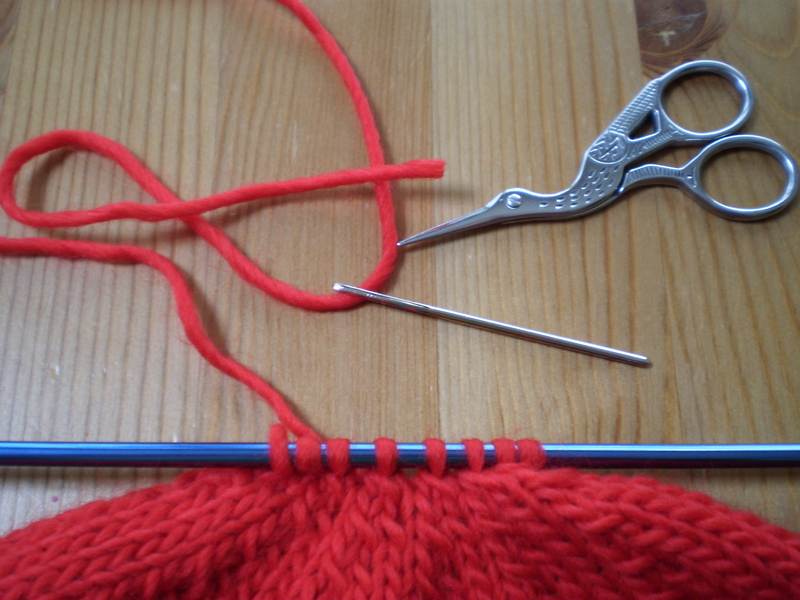 Once you have your last stitches safely contained on your tail, you can remove your knitting needle (So long, knitting needle!) and pull the tail snug. This makes a nice little rosette-dealy at the top of your hat. See? 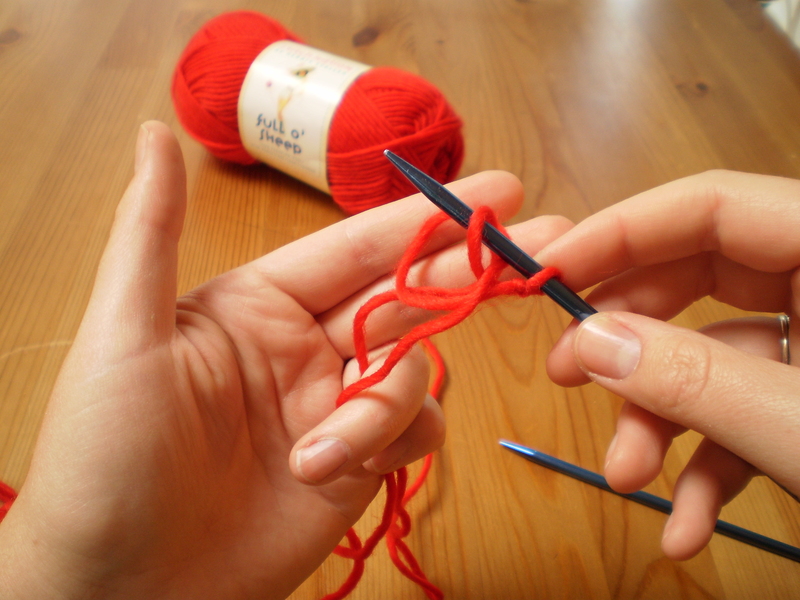 Now, sew the two edges of your knitting together, using your yarn tail. I like to use a mattress stitch, but feel free to use whatever you are most comfortable with (whip stitch will also work well). Try to make your seam as neat as possible, but don’t worry too much (since the seam is worked with the same yarn as the rest of the hat, even messy stitching won’t show up too much). See how you still have those two pesky ends? We have to do something with them (unless you like big hunks of yarn hanging down off your hat, I suppose). So, turn your hat inside-out. See the seam allowance that you made by sewing the two sides of your hat together? Sew your yarn up through that for a couple inches. 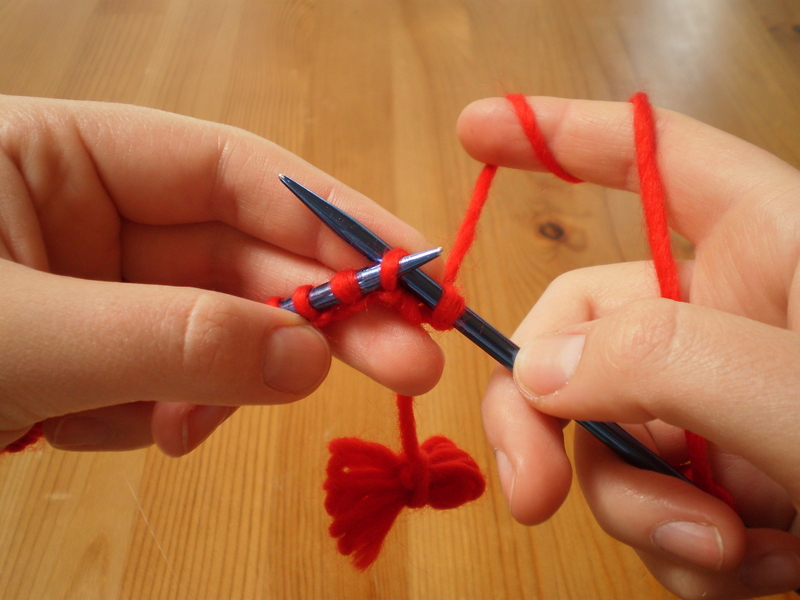 (Throw in a knot or a securing stitch, if you want.) Then, cut your tails, leaving a 1-2 inches dangling inside the hat. And that’s it! You’re done! You have a great knitted cap! Congratulations! If you have questions, please let me know, and I’ll be happy to help! This entry was posted in Knitalong and tagged beginner, beginning, finishing, how to knit, knitting, mattress stitch, n00b, n00b hat, new knitters, sewing, sewing in ends, tutorial on October 18, 2013 by onemilljellybeans. How’s your hat going? Mine’s looking pretty good, and I bet yours it too. But, you’ve probably noticed, that this hat is a big flatty-flat piece of knitting. And, I don’t know about you, but my head is not flat. It is big and round, like a melon. So, we probably need to make our hats a little more head-shaped. We’ll do that by adding some “shaping” to our knitting. 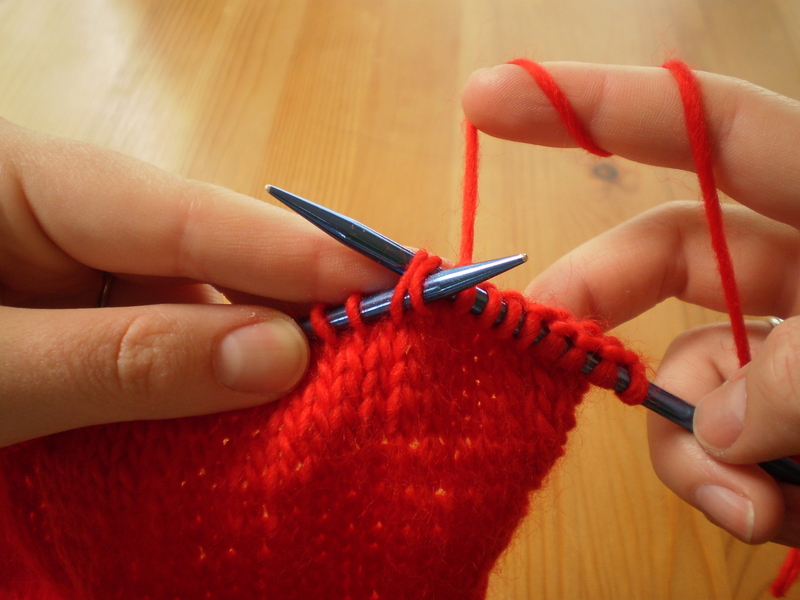 Shaping is a generic term for using special stitches to give your knitting a 3D shape. 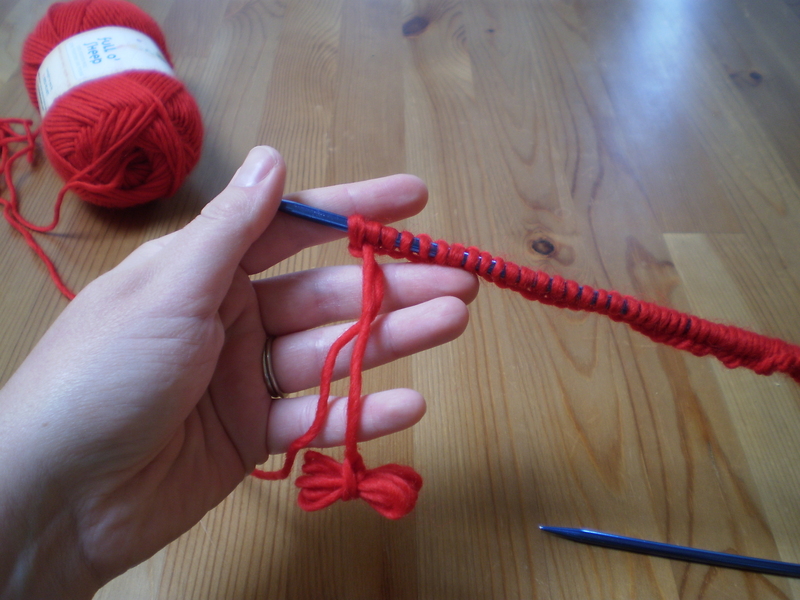 I’ll show you how to do a simple knit two together decrease (which is usually shortened to ‘k2tog’). 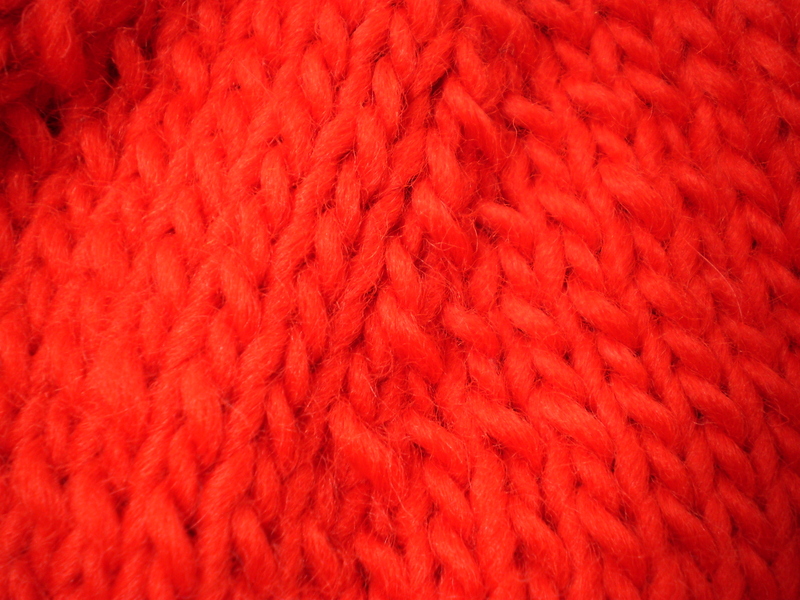 We’re going to do 8 k2togs across each knit row of the hat for the rest of the project. 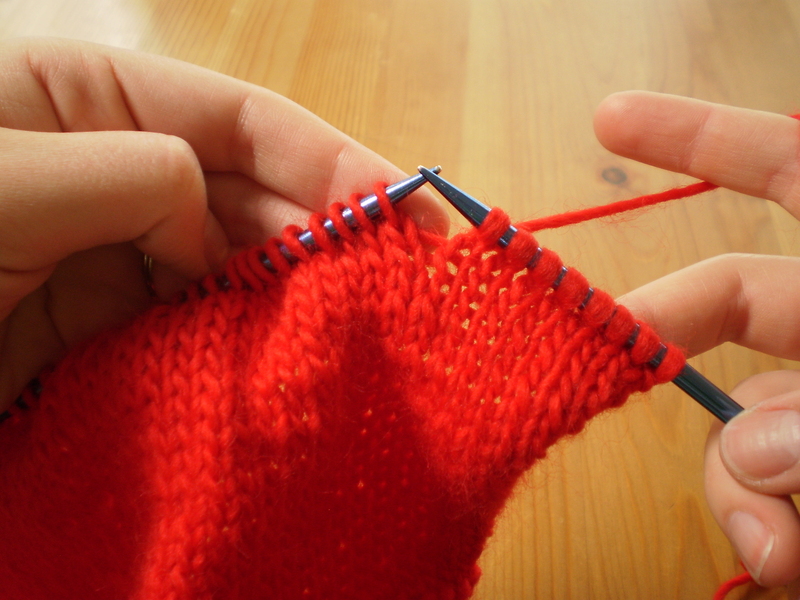 Make sure you are working on a knit row, and start following along. Knit 8 stitches regularly. Then, get ready for a k2tog. 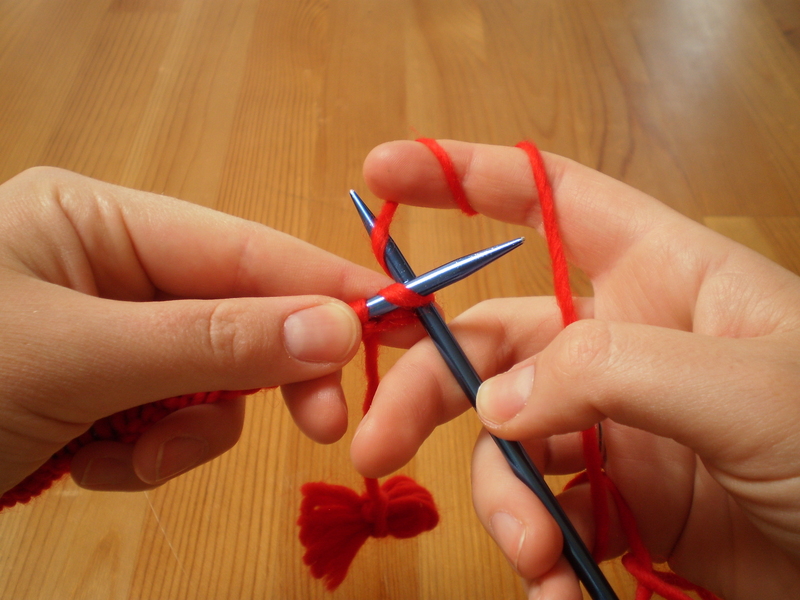 Then, wrap your yarn around the tip of your needle. And pull your new stitch through both old stitches. 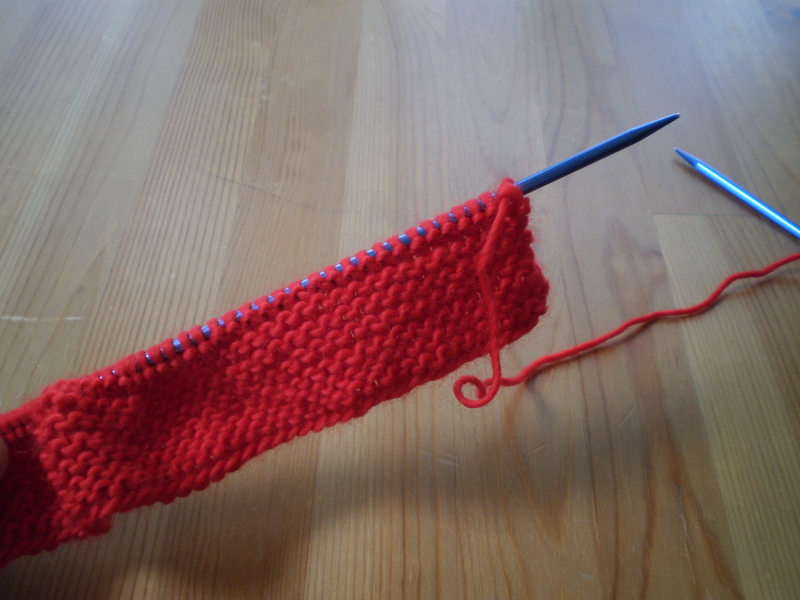 Keep working in the established pattern: Knit 8 stitches, then k2tog. Knit 8, k2tog, knit 8, k2tog, over and over. You should end the row with a k2tog. The next row is a purl row, so purl all stitches (don’t do any decreases). The next row is a knit row, so you’ll do decreases again. This time, knit 7 stitches, k2tog, knit 7 stitches, k2tog, etc. Then work a knit/decrease row. Knit 6, k2tog, knit 6, k2tog, etc. Then do another knit/decrease row. Knit 5, k2tog, knit 5, k2tog, etc. See how the pattern goes? All purl rows are worked like normal. All knit rows include decreases. 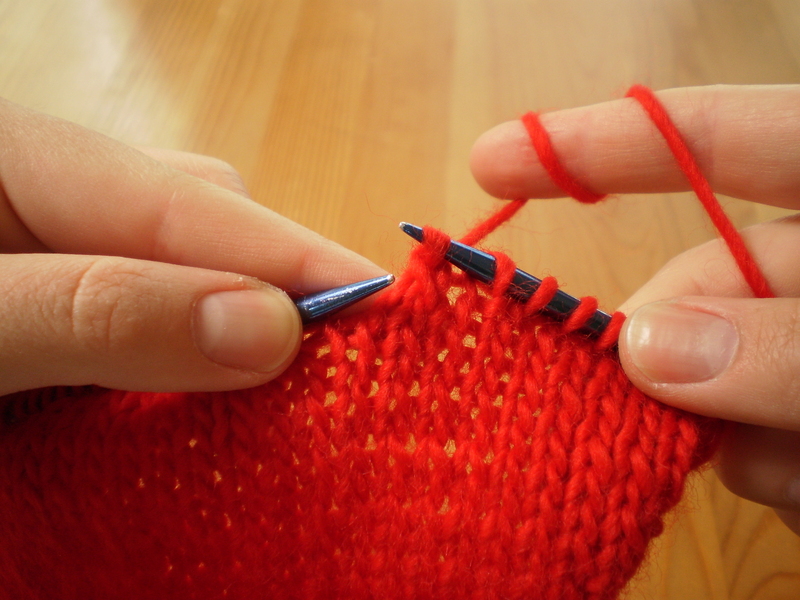 Each time you do a decrease row, you knit 1 fewer stitch between each decrease. (If you find yourself getting confused, make notes on a post-it to help you keep track of where you are.) If you keep working in this pattern, your decreases will end up lining up nicely. Kind of pretty, right? 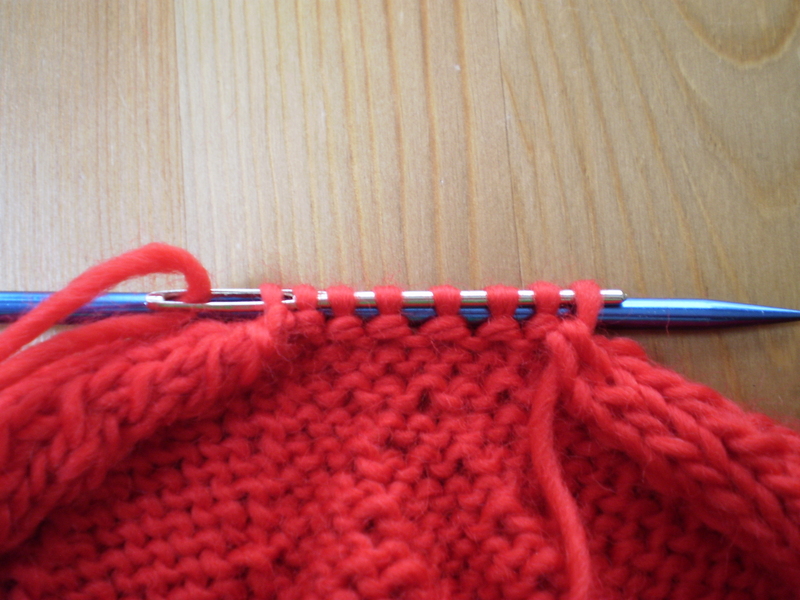 Keep going until you only have 8 stitches left on your needle, finishing with a knit row. See how it actually kind of looks like a hat now? Exciting! Next week, Finishing your hat! This entry was posted in Knitalong and tagged beginner, beginning, decrease, how to knit, k2tog, knit 2 together, n00b, n00b hat, new knitters, tutorial on October 11, 2013 by onemilljellybeans. Are you as excited as I am about this project? Doubtful. Possible, but doubtful. I am very excited. 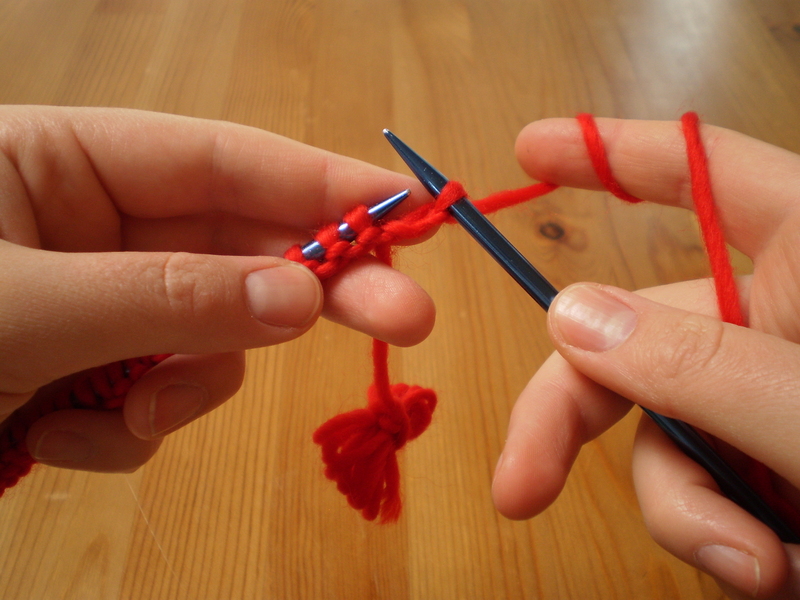 One of my favorite things to do is teaching people how to knit, so this is totally up my alley. So, let’s jump right in and start casting on. Knitted fabric is made of a whole series of loops that all interlock in a very specific way. These loops give the finished fabric stretch, which is what makes knitting so awesome for making sweaters, socks, and hats. The first row of loops is created by casting on. We’ll be doing a long-tail cast on, since it’s the most versatile way to do a cast on. (I use it on 90% of all my projects). Start by measuring out a long tail (duh) that is about 4 times as long as your finished project. (Since this is a hat, you can wrap your yarn around your head 4 times to estimate your length.) Then, make a slip knot at the point that you measured. In this case, you’ll have your ball of yarn on one side of the slip knot, and about 6 or 7 feet of yarn on the other end. Slip the slip knot on your needle and tighten the loop so that it won’t fall off the needle. 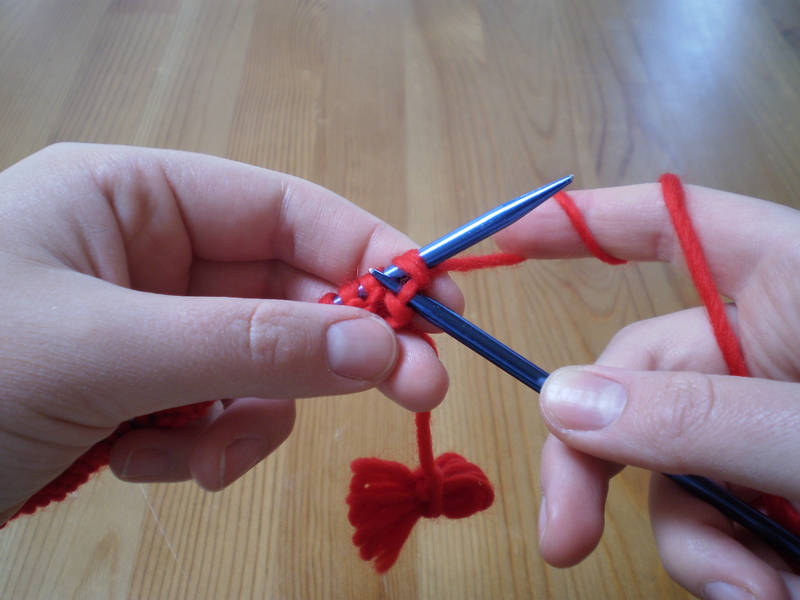 Now, with your non-dominant hand, grab both the ball yarn and the tail yarn with your pinky and ring finger. 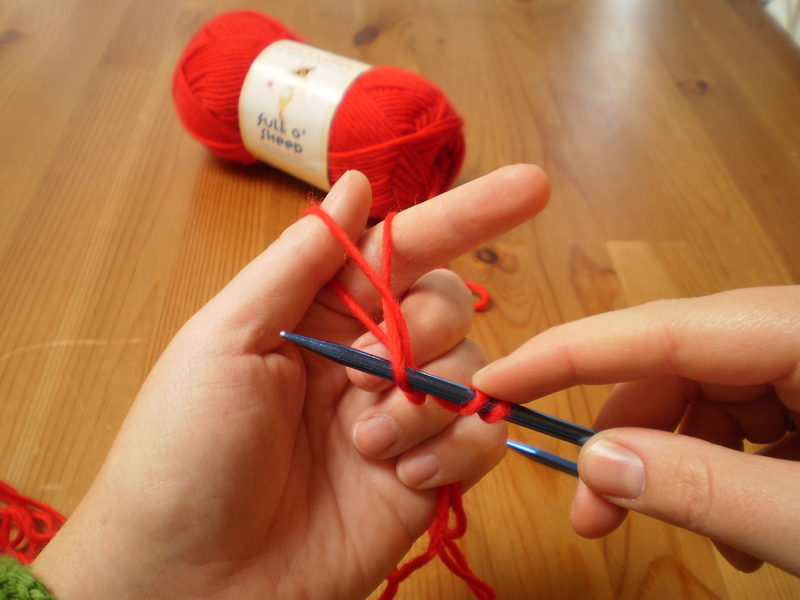 Then, slip your thumb and index finger between the two ends of yarn. 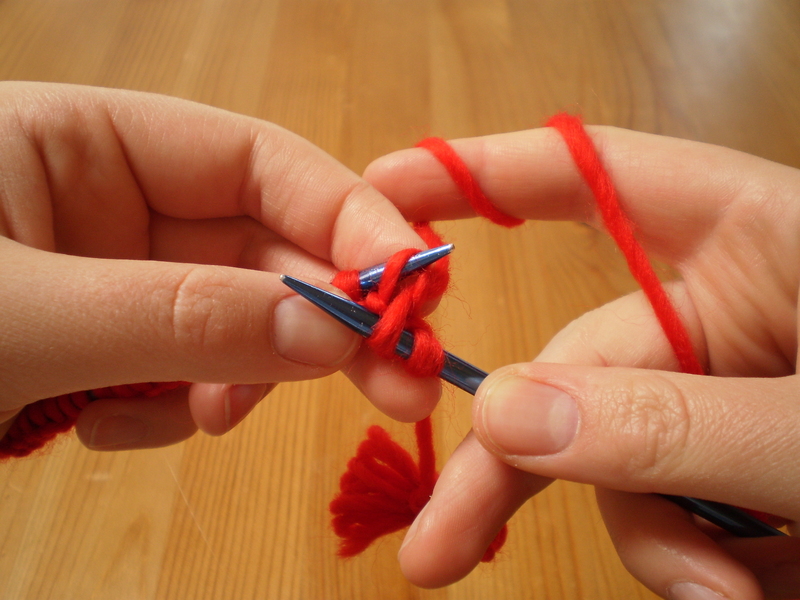 Make sure that the tail yarn is the one wrapped around your thumb. 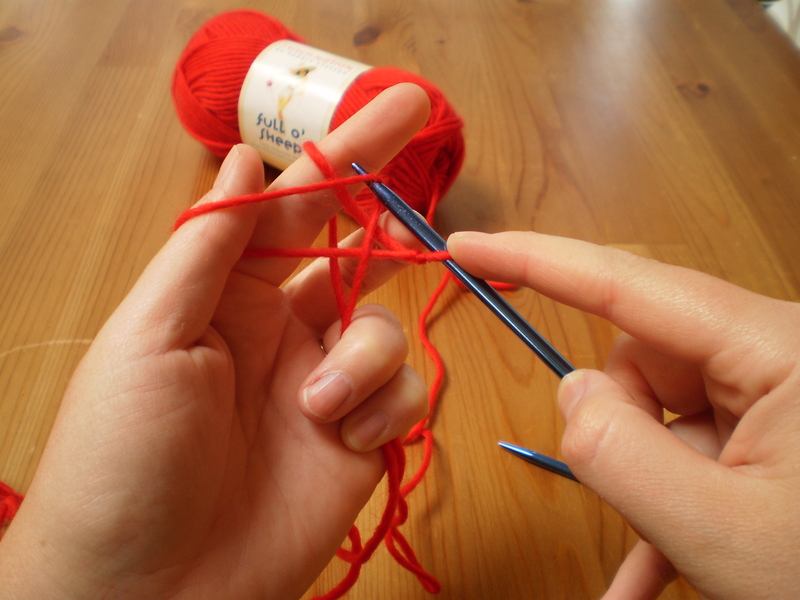 Use the point of the needle to slide from the bottom of your thumb to the top, picking up a loop of yarn. 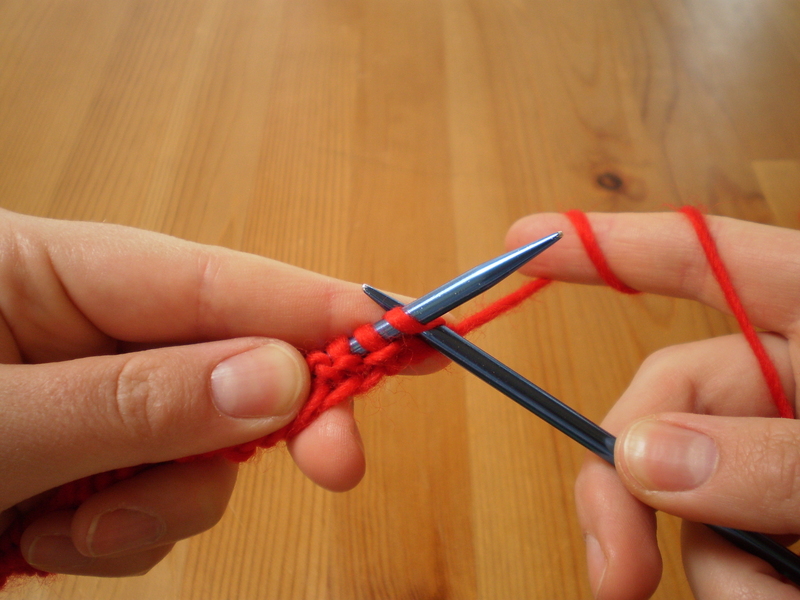 Don’t let the yarn slip off your thumb. 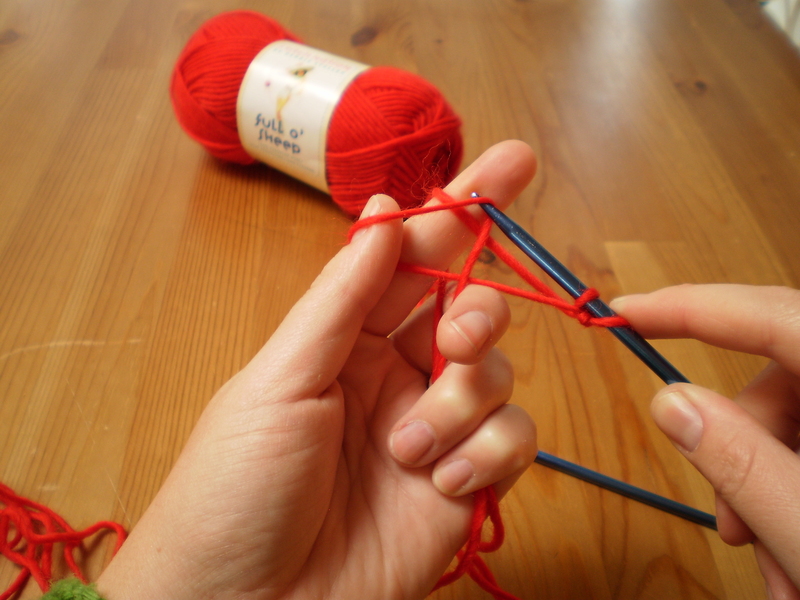 Your pinky and ring fingers should keep tension on your yarn, which can help this. Then, move the point of the needle over to the tip of your index finger. Slide the point of the needle down your index finger, then down your thumb, too. 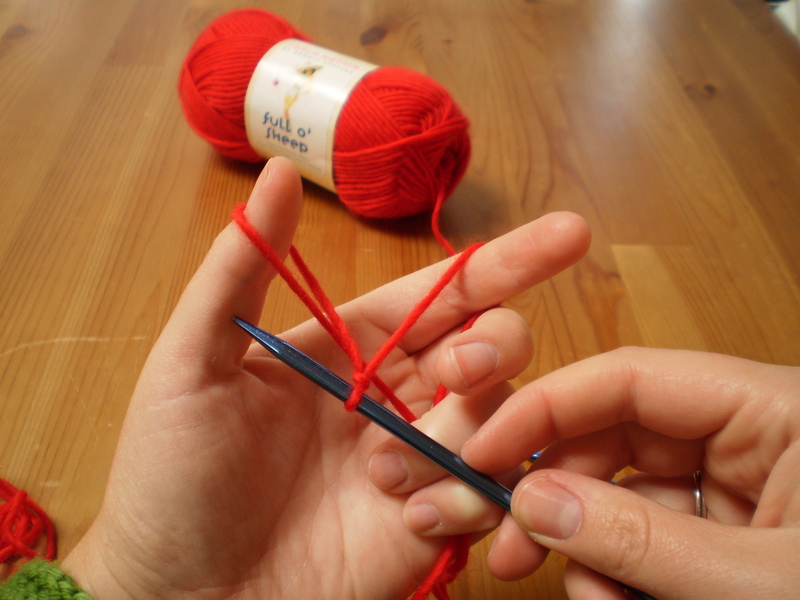 This will hook the loop of yarn from your index finger, and pull it through the thumb loop. Now, here’s the scary part. 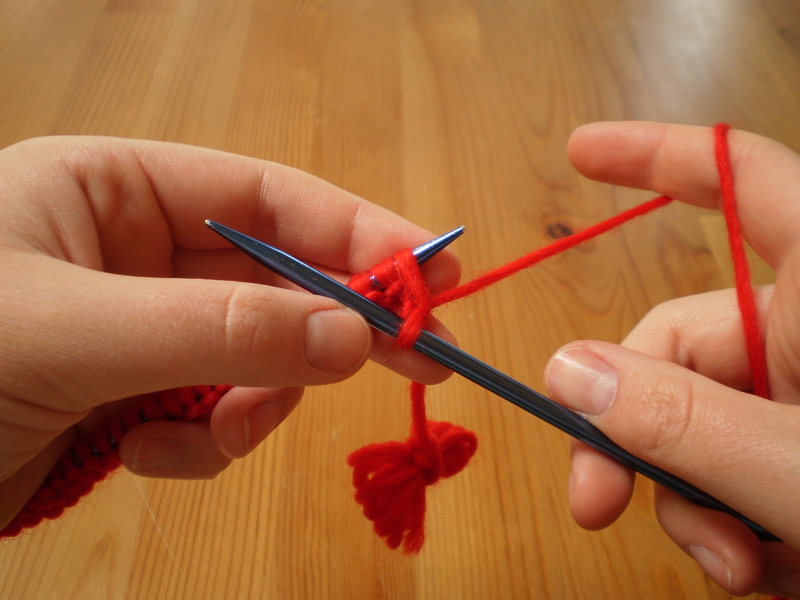 Drop the yarn from your left hand. I promise you won’t loose your work. 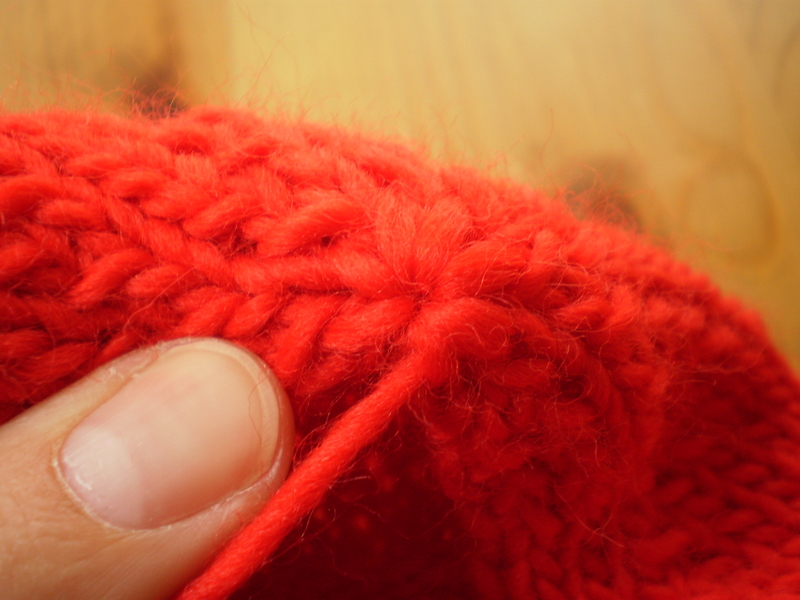 Pull on the yarn tails to snug up your new stitch. Now you have two stitches! Huzzah! And now, you keep going. 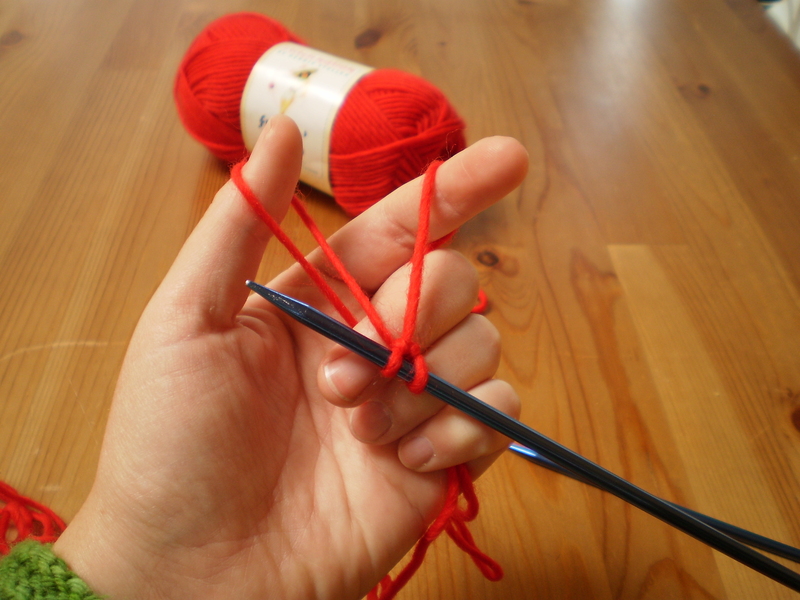 Grab the yarn again in your non-dominant hand, with your thumb and index finger between the tail and the ball yarn. Use the tip of the needle to slide up your thumb, over to your index finger, and back down your thumb, pulling the index finger loop through the thumb loop. 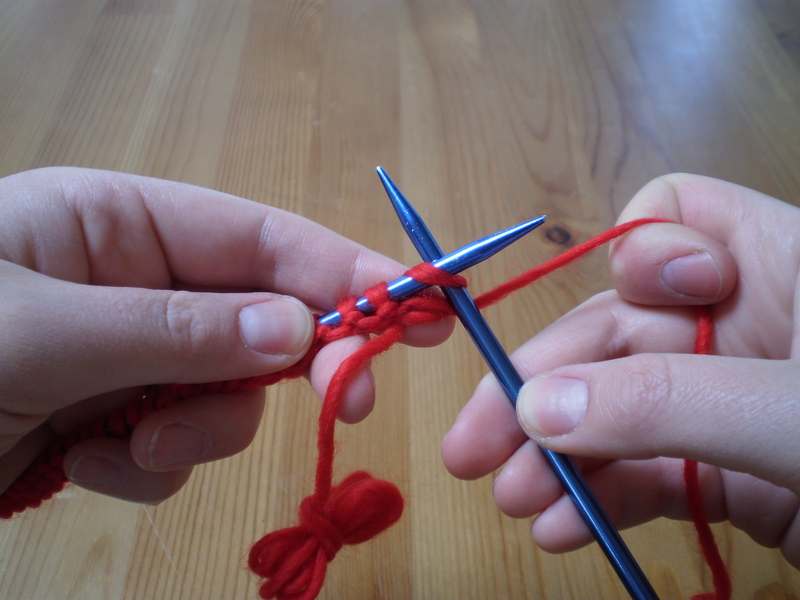 Then, drop the yarn, and tighten up your third stitch. Keep on going, repeating these steps until you end up with 80 stitches on your needle. (I know it seems like a lot, but practice makes perfect. You’ll be burning through them before you know it.) When you get all 80 stitches, tie up any remaining tail yarn into a little bundle to keep it out of your way. You won’t do anything else with the tail until you’re done with all the knitting on this project. Did you get your 80 stitches all cast on? Awesome! Now it’s time to really start knitting. 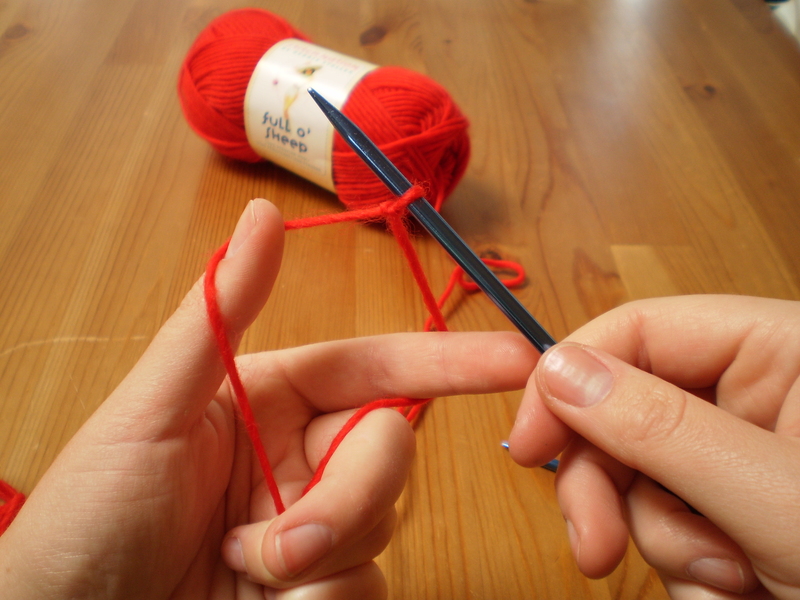 Whenever you knit, you’re going to have the “old” stitches on your left-hand needle, and you will make the new stitches on your right-hand needle. So, that’s how we’re going to start. 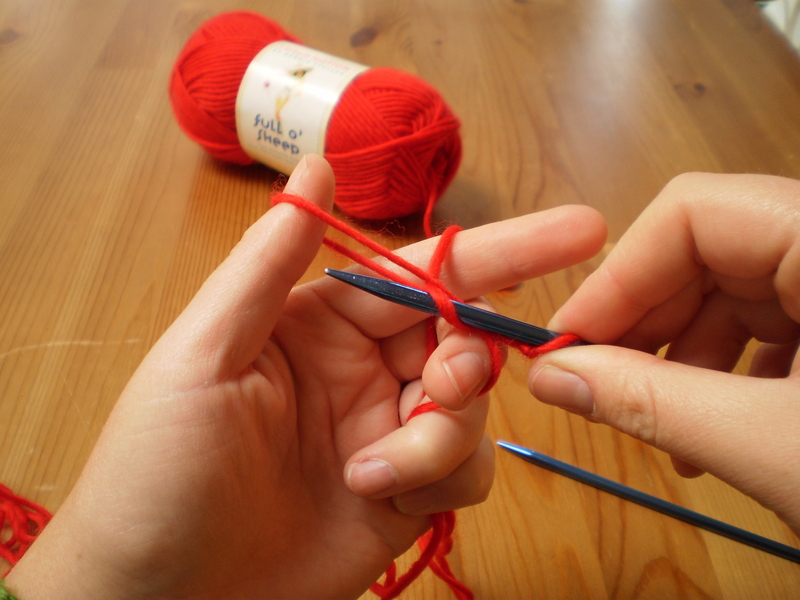 Hold your needle with the stitches in your left hand, and your empty needle in your right hand. Keep your ball of yarn on your right side. 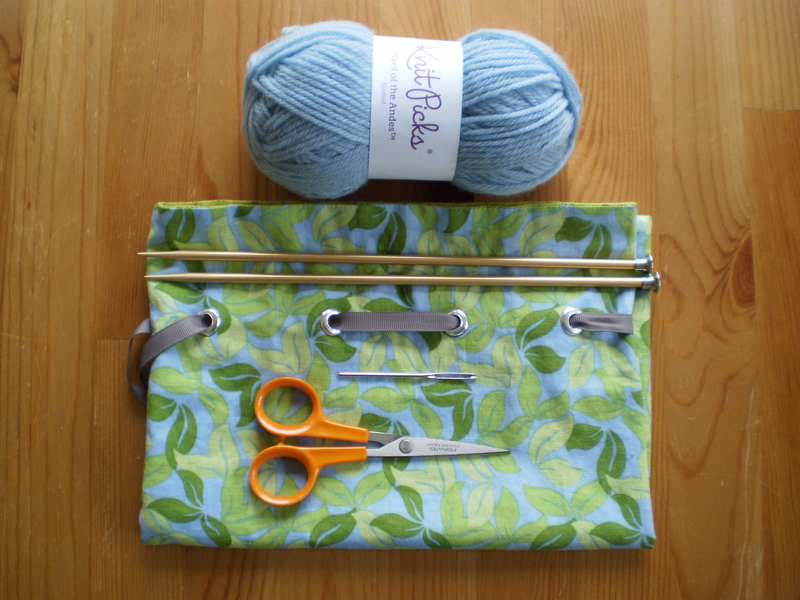 Are you ready to start your first knit stitch? Yes! 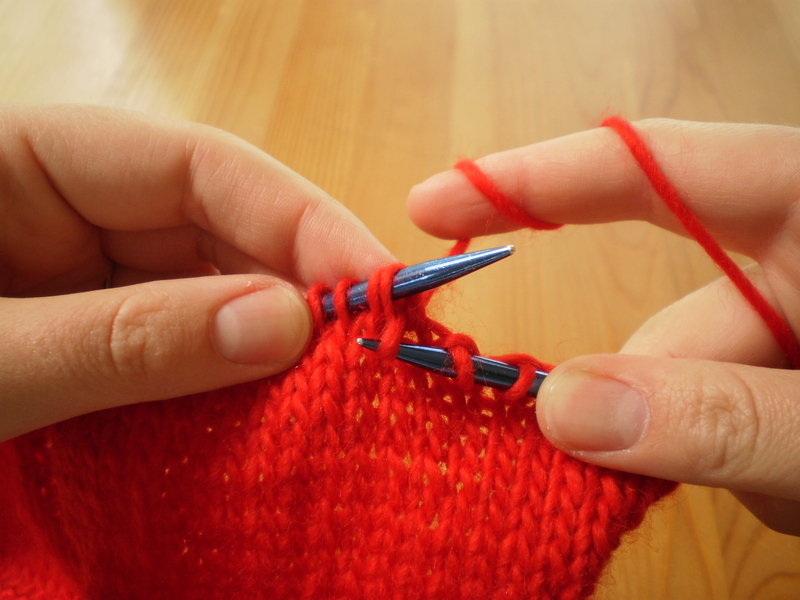 Insert the point of your right needle into the front of the first stitch, with your yarn held behind your knitting. (The “front” of your knitting is the side that faces you as you work on it. The “back” of your knitting is the side that faces away from you.) 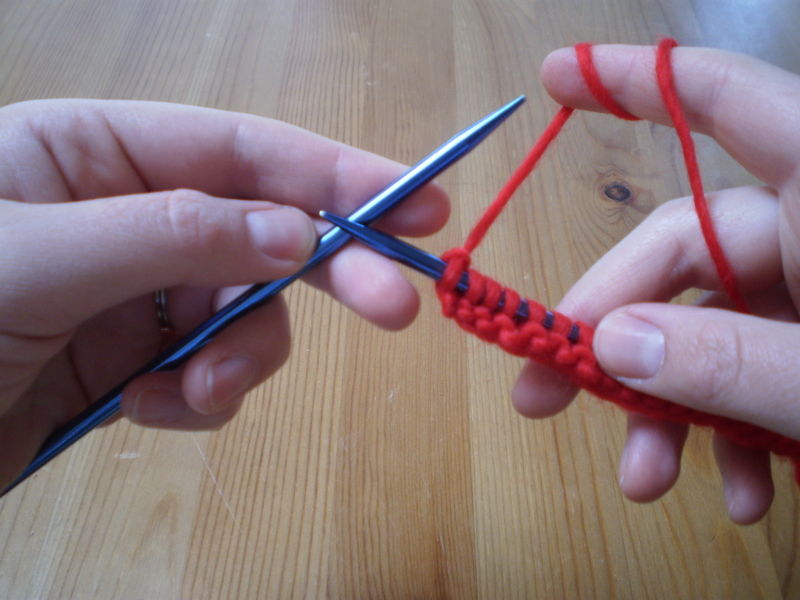 It should look like this: Then, wrap the yarn around the tip of the right-hand needle. Pull that new loop carefully through the old stitch. This is tricky at first, so keep trying. 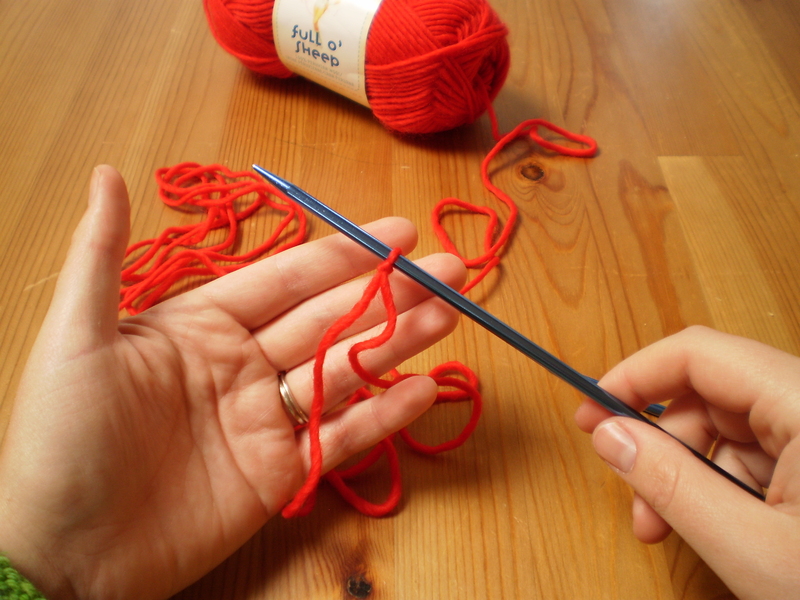 If you keep a little tension on your yarn, it makes it easier. 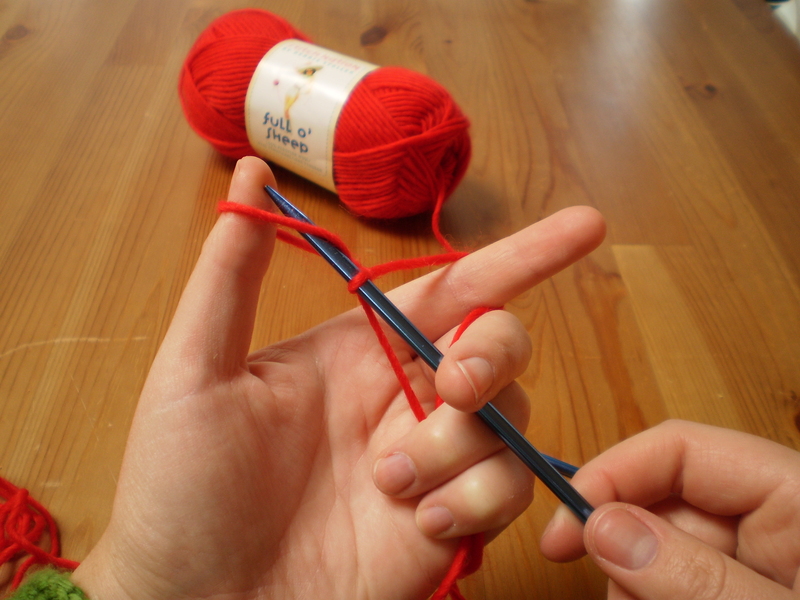 I like to wrap the yarn around my index finger to help keep tension, but if you don’t like that, try holding the yarn between your index an thumb, or wrapping it around your whole hand. Every knitter holds their yarn a little differently. Find what feels good to you. 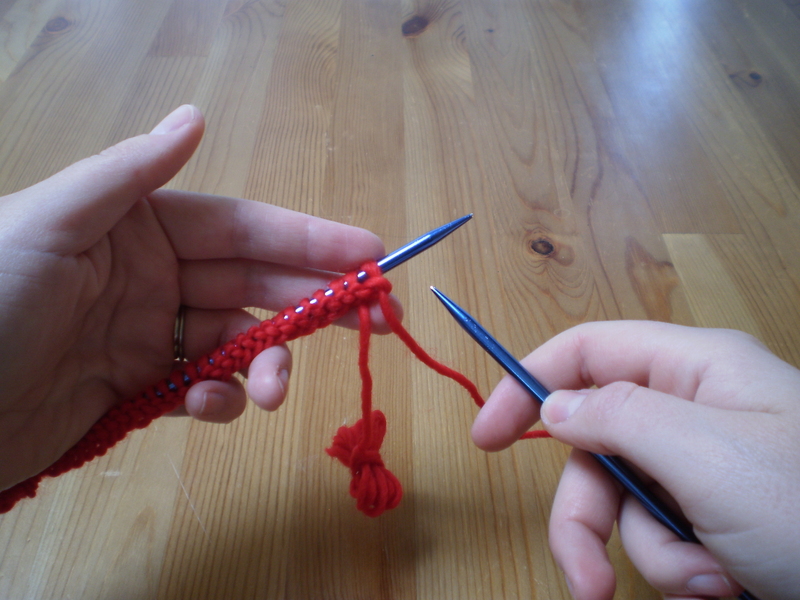 You’ve made your new stitch (the loop you just made on your right-hand needle). Now it’s time to get rid of your old stitch. 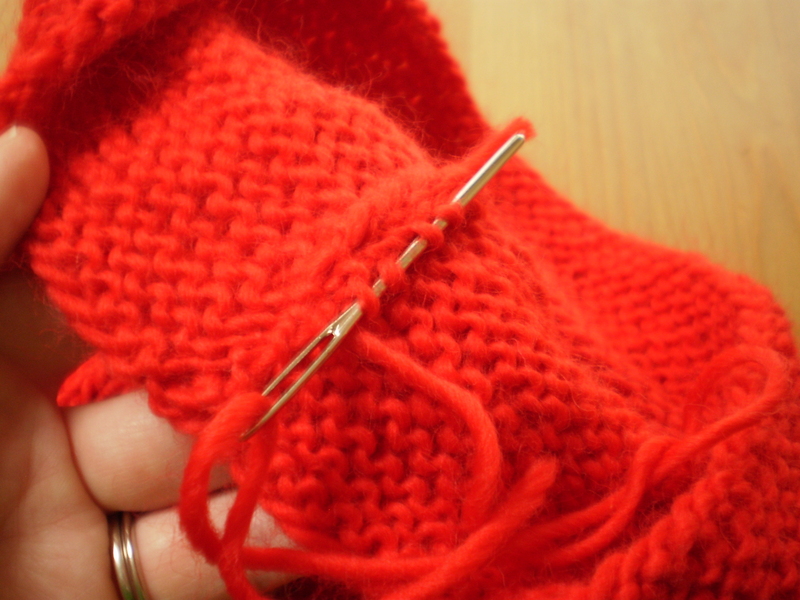 To do this, simply slip it off the end of the left-hand needle. Easy. 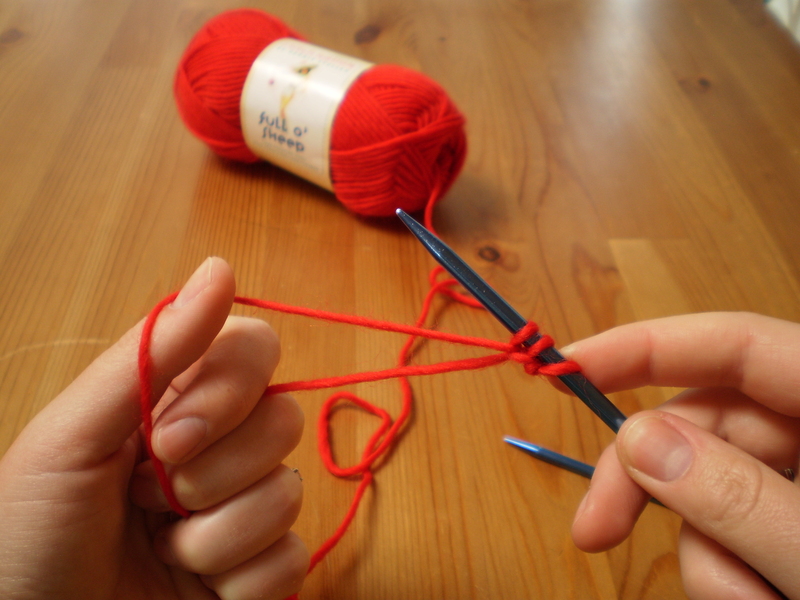 Knit your second stitch: Insert your right-hand needle into the front of the next stitch, wrap your yarn around the tip of the needle, pull the new stitch through, and then drop the old stitch off the end of the left-hand needle. Two stitches done! Keep going like this until you reach the end of the row. When you get to the end, swap your needles, so that your empty needle is in your right hand, and your needle with stitches on it is in your left hand. Then, keep knitting away! This pattern is called “Garter Stitch.” It’s made when you knit every single row. This is the brim of the hat we’re working on. I worked my garter stitch for about 2 inches. 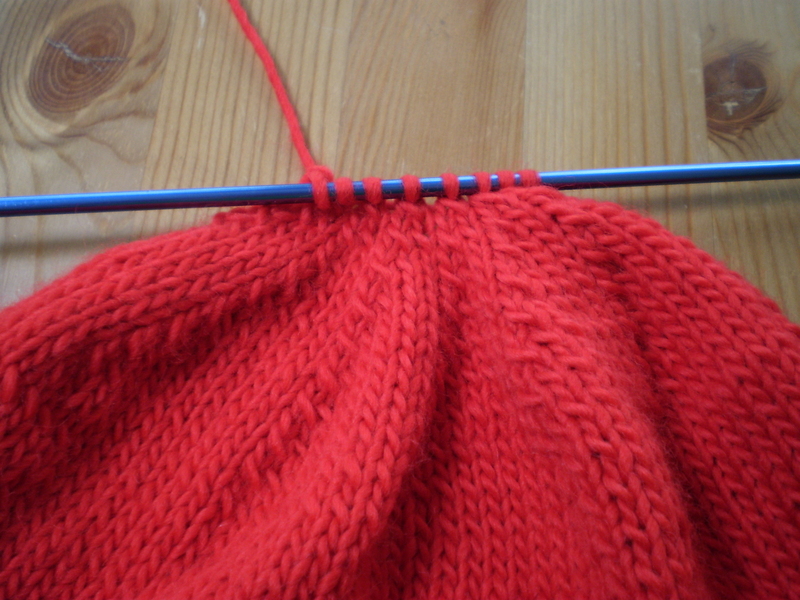 You can make your garter stitch brim wider or narrower by knitting more or fewer rows. 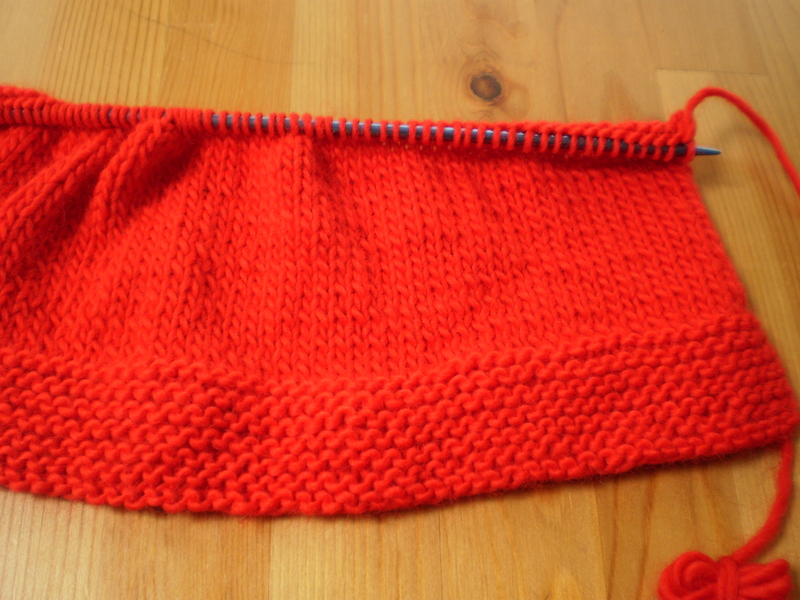 Next week, we’ll make the body of the hat, and I’ll show you how to work the purl stitch. Happy knitting! This entry was posted in Knitalong and tagged beginner, beginning, cast-on, casting on, hat, how to knit, knit stitch, knitting, long-tail cast-on, n00b, n00b hat, new knitters, tutorial on September 27, 2013 by onemilljellybeans. 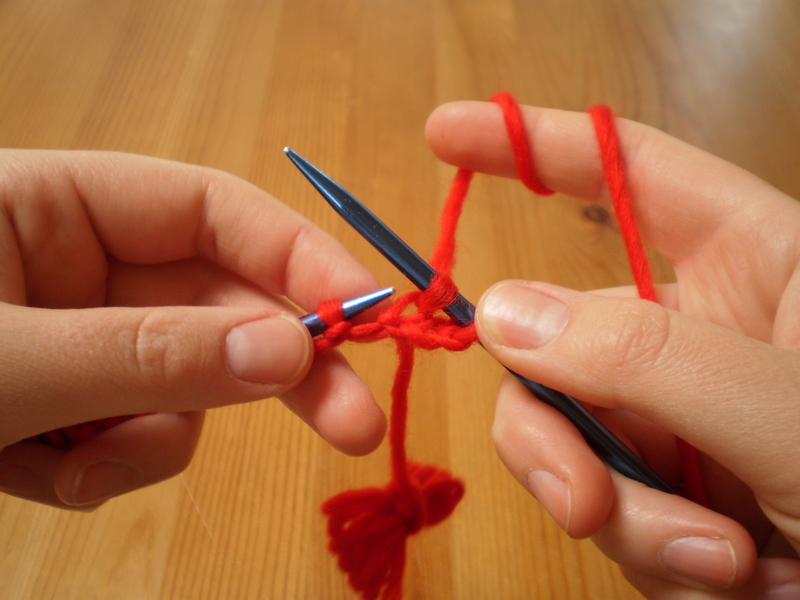 So, I heard that some of you don’t know how to knit (yet). If you’re interested, let’s fix that. This is a pattern I created years and years ago. I was part of my college club the “Knitting Illini” (at the University of Illinois, hence the “Illini”). We had to teach a new crop of people how to knit every year, and we didn’t want to scare them off with great big scarves, or boring washcloths. 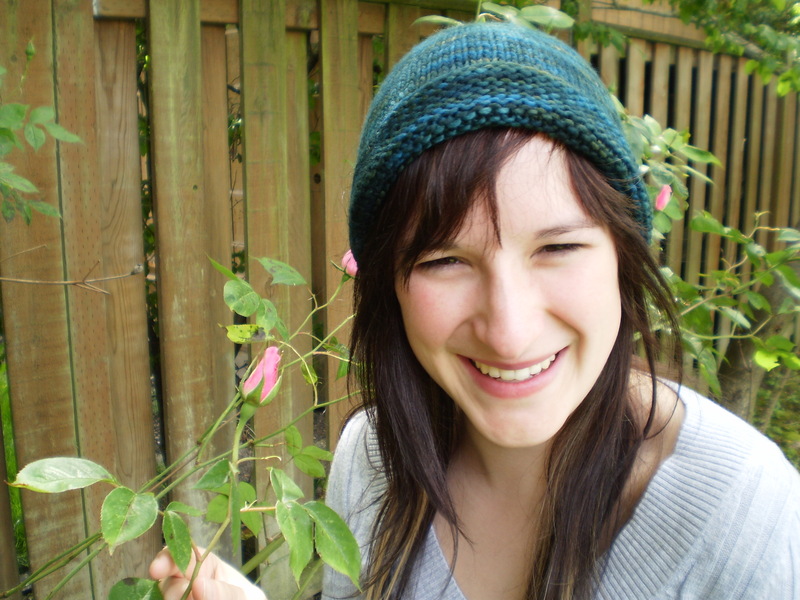 I thought a hat was a fun, useful, and small enough project for new knitters. And, you end up with a hat at the end of a couple of weeks. Win-win. 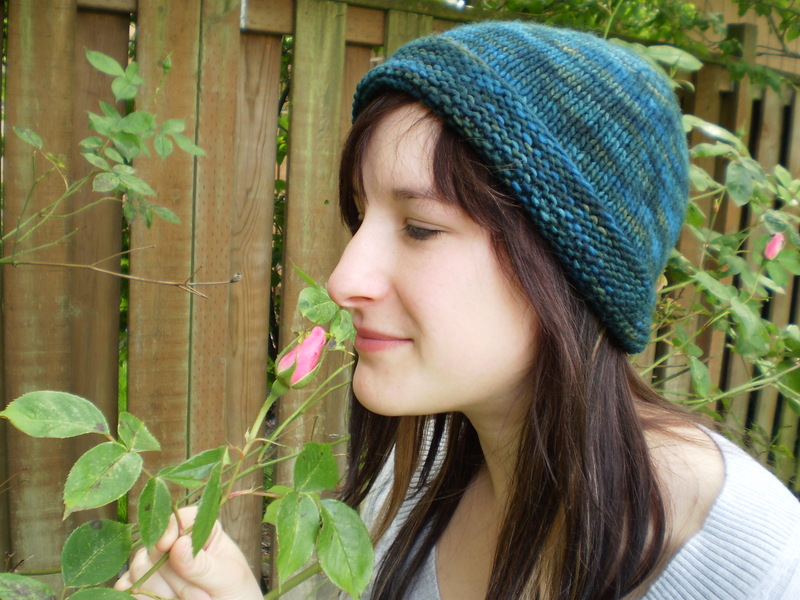 It’s a basic beanie with a garter stitch brim. It’s knit flat and seamed up the back. It’s pretty much one size fits all, and is super cozy. I have a couple I’ve made over the years and I wear them all the time. I’m going to be posting small chunks of the project every Friday for the next couple weeks. That way you can play along at home. 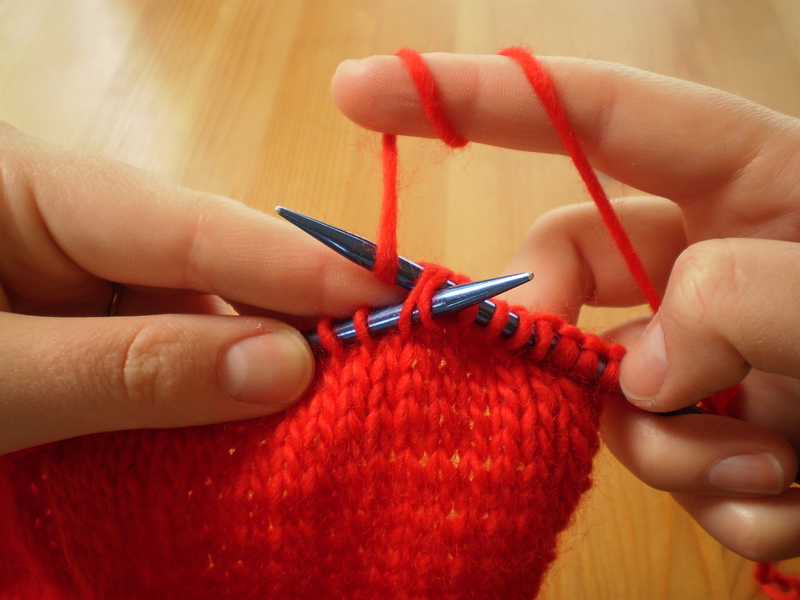 As you work on the hat you’ll learn how to cast on, knit, purl, decrease and finish a project, skills that constitute about 90% of all knitting. And, if you keep up, you should end up with a pretty nifty hat by the time truly cold weather kicks in. -1 skein of worsted weight yarn. You can go luxurious or cheap, or somewhere in between. If you want to go the cheap route, Red Heart SuperSaver costs about two bucks and can be found literally everywhere. If you want to go the luxurious route, find an independent yarn store and ask the clerk to get you something fancy for a worsted weight hat. May I recommend Malibrigo? 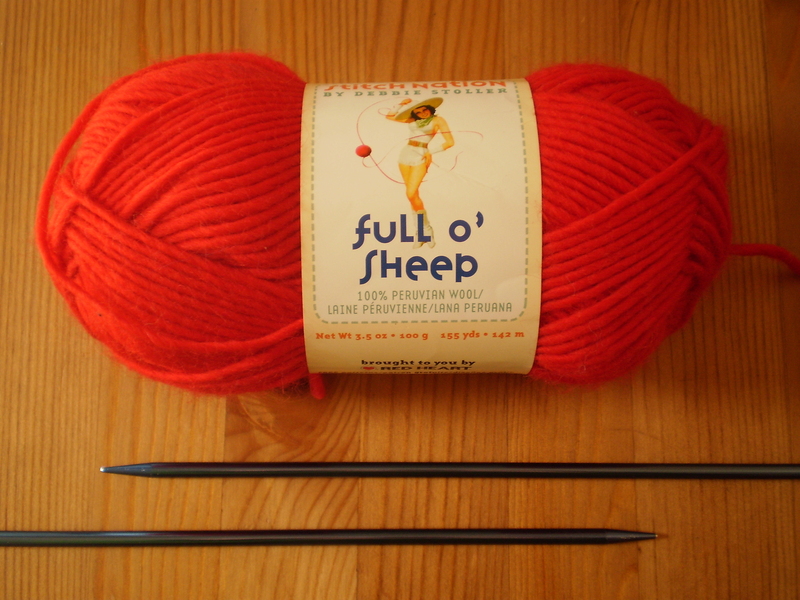 -1 pair of size 8 knitting needles. Whatever kind you like. I recommend straight needles for ultra beginners. Wood or metal, doesn’t matter. -1 tapestry needle. I forgot to take a picture of this. It’s a big sewing needle. Sometimes they are metal, sometimes they are plastic. You’ll use this at the very end to finish your hat. -1 pair of scissors (or really strong teeth, I suppose). You won’t need these until the very end. This entry was posted in Knitalong and tagged beanie, beginner, beginning knitting, hat, how to knit, how-to, n00b, n00b hat, pattern, tutorial on September 20, 2013 by onemilljellybeans.